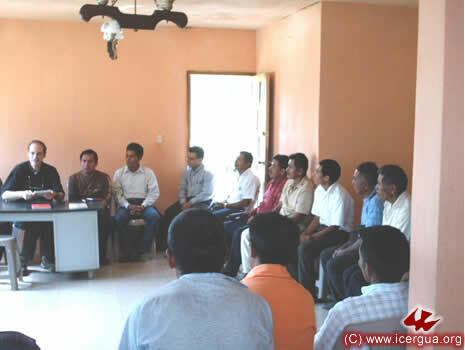 The meeting of the Deanery of the North took place in the Central Mission of the North, located in Tomtem, Cobán. All the delegates were present and participated. An especially positive aspect of the meeting was the presentation of “The Church on the Move” in the K’ekchi language. The successful completion of this publication was the outcome of an enormous effort. Beginning on the first of June, our K’ekchi-speaking communities will be able to do the celebration of the Word, the readings and prayers, in their own language. In addition there was discussion of establishing parishes in the region and of the steps that are to be followed to make that a reality. Photo above: The meeting. 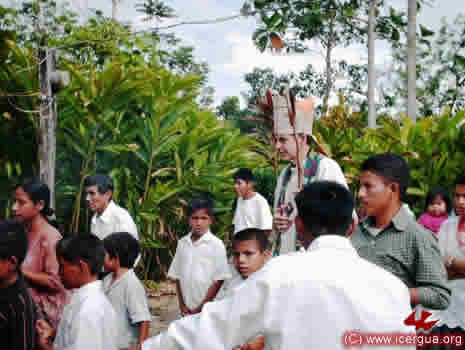 At the right of the bishop is Father José Ángel Núñez, responsible for the communities of San Pedro Carchá, the city of Cobán and the communities near Cobán. 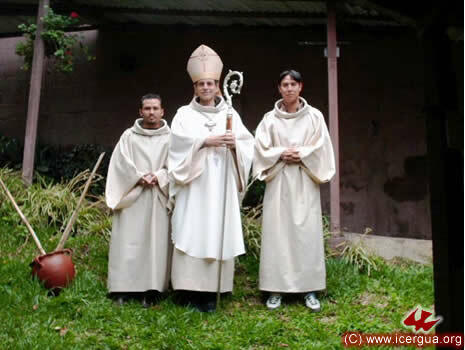 At the left of the bishop is Father Freddy González, responsible for the care of the northern communities of Cobán, Ixcán, Chisec, Raxujá and Petén. During the evening of May 1, the bishop celebrated the Eucharist in the Community of the City of Cobán. It is a newly formed community, mostly of Quiché-speaking shopkeepers and tradesmen. 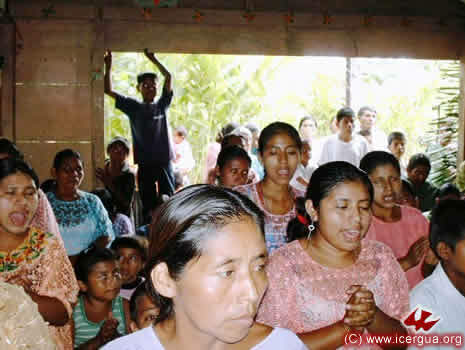 In the photo: Following the celebration of baptism, the parents and sponsors are praying intensely for their children. 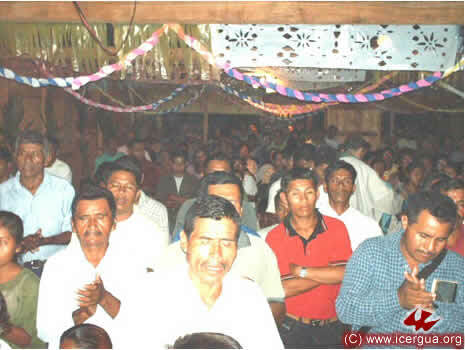 In the morning of Saturday, May 2, there was a large celebration in the Community of Tamariz, La Libertad, Petén. Four marriages were celebrated. The community had been at vigil since the previous day. When the bishop arrived, a procession began from the place where they met for the vigil and moved to the temporary church. Crossing the whole village took fifteen minutes. Above: Two of the couples who were married, during one of the moments of the celebration. Right: The new church, which the faithful of Tamariz are completing. It is large and solid. They expect to complete it in a couple months. 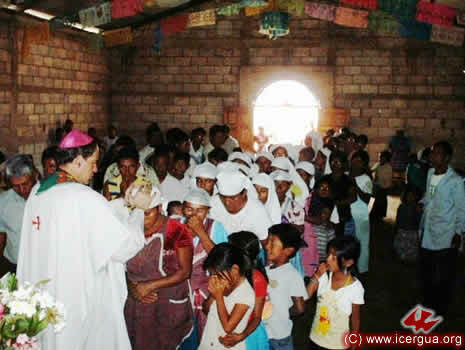 The bishop visited the community of La Samaritana, in the north of Chisec, for the first time. The community began only a short time ago, and is already growing. 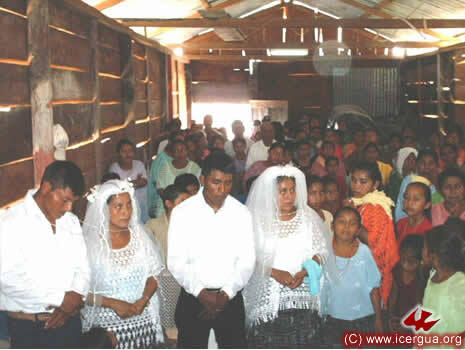 The witness and the zeal of brother Thomas, leader of the community, help make it possible that not only here but in all the nearby communities of Chisec and also of Sayajché, Petén, the Renewed Catholic communities are continuing to grow and to consolidate their growth. Above: The bishop joins the procession toward the house of prayer to begin the Eucharist. Left: The celebration. The active, fervent participation of all the members of the community is remarkable. Sesaquiquip is a village in the municipality of San Pedro Carché. But its geographical position is such that it has more communication with the Municipality of Chisec. The community made an alliance with ICERGUA a few months ago. Already it has grown enormously and has a remarkable fervor. In fact, four candidates for the priesthood from this community are now studying in the Seminary, all of them quite fervent and vibrant. Above: Entrance procession at the beginning of the Eucharist. It was difficult to get to the altar, for around a thousand faithful Christians were in attendance. 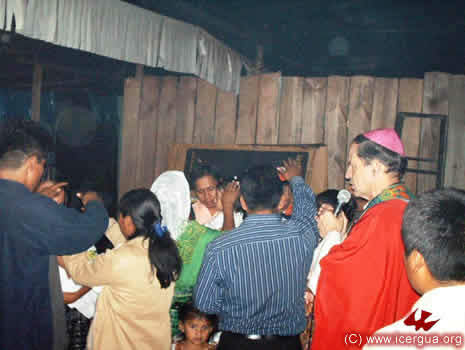 Left: The gathered Christians, while the bishop is distributing communion to participants at the Eucharist. 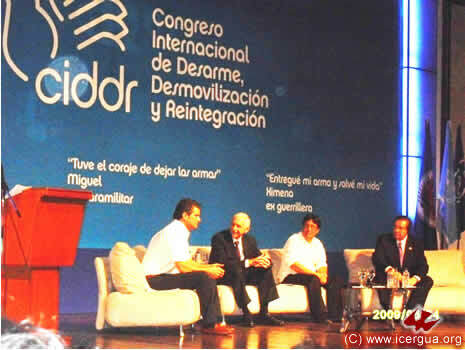 The government of Columbia, with the collaboration of the World Bank, the United Nations, U.S. Aid, the European Union and other Columbian and international organizations, organized the First International Congress on Disarmament, Demobilization, and Reintegration of Communities. The Congress met in Cartegena from May 4 to 6. Our bishop was invited as a panelist in view of his broad experience with the topic, the result of years working as a missionary among the communities that ICERGUA serves. He was invited to inform the congress of specific cases in the context of a panel on “How to mitigate adverse effects of delinquency and organized crime on reintegration processes? What counter incentives enable legitimate avenues of social and economic reintegration to effectively compete and overcome illegal and criminal paths?” There were participants from fifty-seven countries. The Congress was opened by the Vice President of Columbia, Dr. Francisco Santos, and was closed by the President of Columbia, Álvaro Uribe. President Álvaro Colom of Guatemala was also present and spoke. In the photo at the right: Opening panel. From left to right: the representative of the Organization of American States to the legal processes now in progress in Columbia, the director of the International Organization for Immigration, the Vice President of Columbia, and the delegate of the Secretary General of the United Nations. 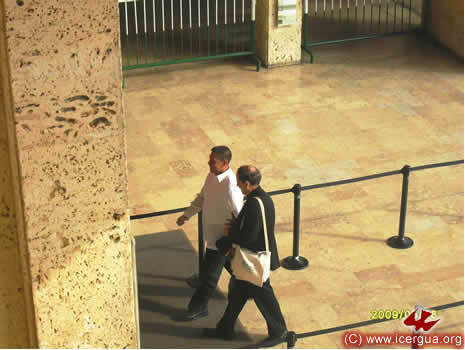 LEFT: Our Bishop walking to the Convention Center "Julio César Turbay Ayala, talking to the Presidential Delagate from the Philippines. 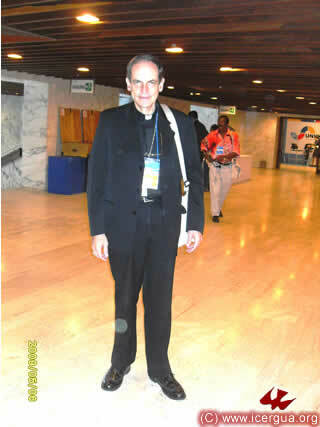 BELOW: To the left, Bishop Eduardo, at tje Lobby of the Convention Center. To the right, talking to the Director of the Columbian Foundation "Ideas para la Paz", one of the organizer Institutions of the Congress. The twelve seminarians in the Introductory Year. 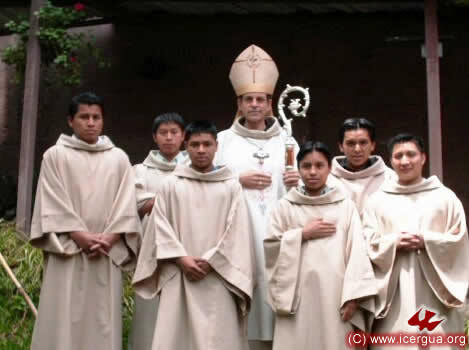 From left to right at the back: Jesús, Luís Miguel, Marcos, Josué, Bp. Eduardo, José Luís, Luís Fernando. At the front: Edgar, Oscar, Juan Gabriel, Mauro, Federico and Gaspar. The six seminarians in first year. From left to right: Rubén, Arnoldo, Glicerio, Bp. Eduardo, Baltazar, Jorge and Eduardo. The three seminarians in third year. From left to right: Bernardo, Bp. Eduardo and Byron. Higinio was absent when the picture was taken. The two seminarians in fourth year: From left to right: Eddy, Bp. Eduardo and Ambrosio. The two seminarians in fifth year. From left to right Yaider, Bp. Eduardo and Orlando. The five seminarians in sixth year. 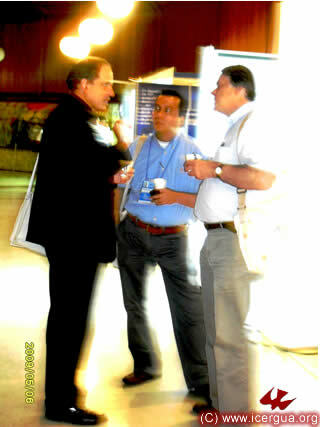 From left to right: José Armando, Nelso, Marco Tulio, Bp. Eduardo, Pedro and Esduardo. The four seminarians in seventh year (EPS). From left to right: Felipe, Bp. Eduardo and Juan Moisés. 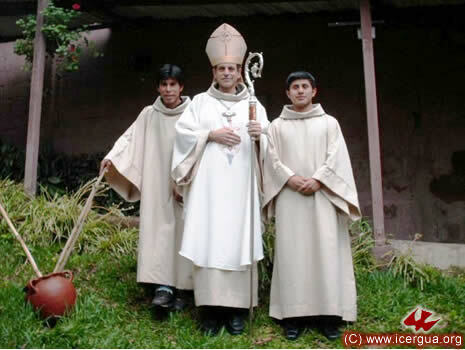 Marcos and Gildardo were in their pastoral assignement when the picture was taken. Above: A group of seminarians around the Bishop, before the beginning of the Mass on Thursday, May the 21st. During the afternoon of Friday, May 8, Monsignor Eduardo visited the communities of Tzununá and Jaibalito. Both are located on the banks of Lake Atitlán within the municipality of Santa Cruz La Laguna. Their growth has been slow, but steady. 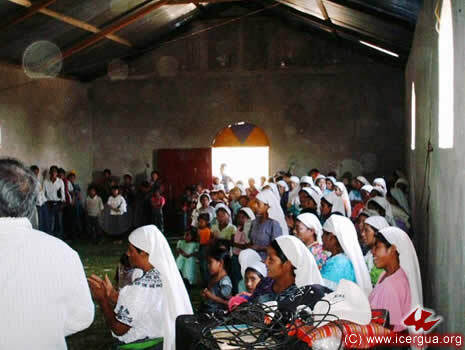 Both communities are at present determined, in addition to their spiritual and outreach commitments, to complete the construction of their houses of prayer. 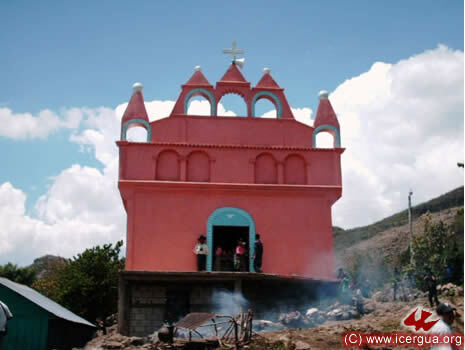 The community of Tzununá has finished constructing the walls of its new church, and the next step is to roof them. 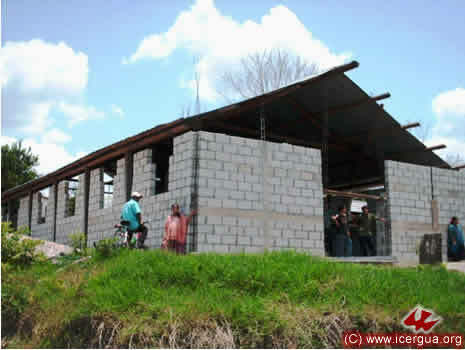 The community of Jaibalito has completed the internal construction and all that is left is to finish doing the façade. Chiantla, Jacaltenango, Cuilco, La Democracia (including Santiago Chimaltenango), La Libertad, San Sebastián H (including San Juan Atitán), Santa Bárbara, San Pedro Necta, the city of Huehuetenango, Santa María Chiquimula (Totonicapán) y Concepción Tutuapa (San Marcos). In general the report was very positive, for in spite of the small difficulties they are facing, clear growth is reported in all the areas. There are new communities that are making alliance with us and many others are beginning. The meeting stressed the importance of outreach commitment and the reaffirmation of the “Renewed Catholic” identity, implying the centrality of the Eucharist in all of life, the commitment to mission outreach and to work together so that the events that, according to the Scriptures, took place in the Early Church, may continue to be present in our communities. 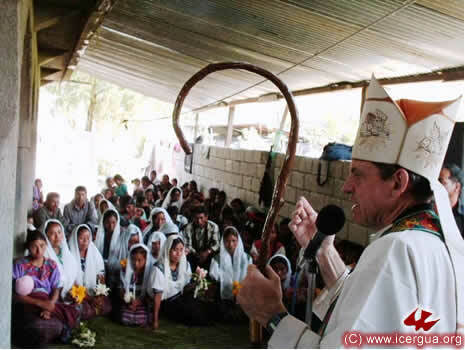 On the afternoon of May 9 our bishop made a pastoral visit to the community of Mapá in San Sebastián. This community made an alliance a few months ago. After intense preparation, beginning in November of 2008, 35 baptisms, 33 first communions and two marriages were carried out. This celebration has strengthened the community in its Christian life and Renewed Catholic identity. On Sunday, May 10, in the morning, Monsignor Eduardo celebrated Eucharist in the community of Brasilia, zone 7, Huehuetenango. 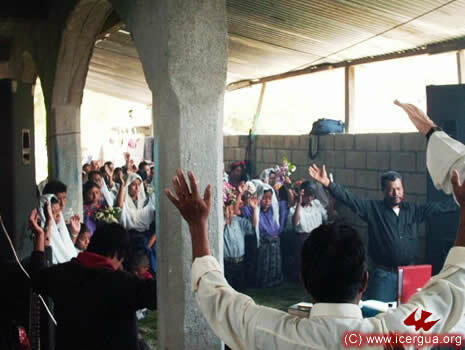 Within the framework of the celebration the daughter of a family that has recently joined the community was baptized. On the afternoon of May 10, our bishop made his first visit to the new community in the municipality of Santa Bárbara, Huehuetenango. In spite of there being only a few members in the community, their enthusiasm and firm commitment to mission outreach, so that the road that they have set off on can reach to many more people, was obvious. On Tuesday, March 12, the bishop had a meeting with representatives of the Renewed Catholic Community of “Los Guates,” San Juan Sacatepéquez. Father Santos Acosta Sol, who accepted direct responsibility for pastoral care for these communities, also participated in the meeting. The Eucharist had been scheduled for three months. The growth that has taken place in the San Juan Sacatepéquez was also reported. A community in the village Los Pirires has decided to make an alliance with us and there are various communities in other villages with whom dialogue has begun. The enthusiasm and commitment of all the faithful, the members of the community of Los Guates as well as those responsible for them, is clear. On the evening of Saturday, May 16th, Bp. Eduardo celebrated the Eucharist at the "Comunidad Pacto Divino" Church, located on 6th street, downtown Los Angeles. The community has around 300 members, the majority of them, young adults. Brother Danilo, from Quezaltenango, is the Coordinator of the Community. Our Bishop during the Homily. 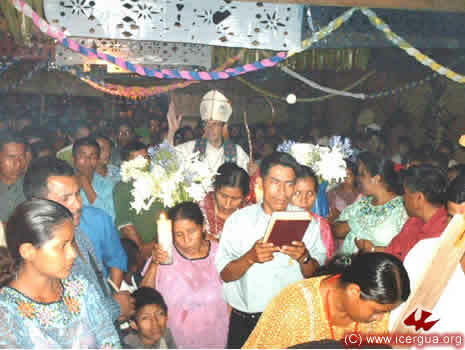 During the celebration Brother Pedro, from San Andres Xecul, Totonicapan, was instituted as Minister for the distribution of the Communion. On Sunday, Bp. Eduardo presided the Eucharist and a meeting with the Pastoral Council of the Mission of ICERGUA in Los Angeles. In the picture to the left, some of the members of the Council. 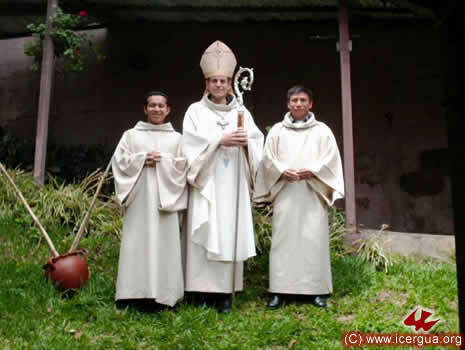 The President is Brother Leon, of the Ministerio El Pescador (second from left to right), Vice-President is Brother Danilo of Pacto Divino (to the right of Brother León), Member at large is Brother Lorenzo of Ministerio Luz y Vida (to the right of the Bishop). 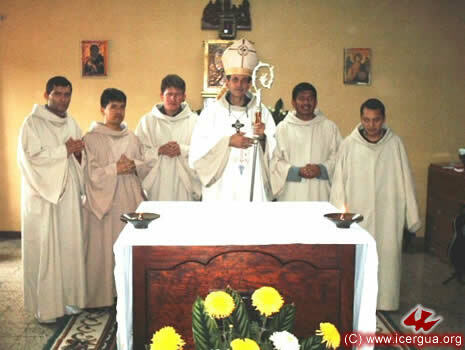 As part of the call received by ICERGUA to unconditionally work towards the rediscovery and implementation of the Apostolic Tradition and the Faith and Organization of the undivided Church, on May the 19th, it took place a meeting at the Monasterio Ortodoxo de la Santísima Trinidad-Lavra Mambré located near Amatitlán. In the fram of the Meeting, it took place a symbolic exchange: Mother Inés, Abbess of the Monastery gave to our Bishop a copy of the recently published "Orthodox Catechism" and our Bishop gave here some of our Catechetical y Liturgical Books. The family of Father Hugo Patzán, has been going through very difficult moments. On April 29th, Juan Francisco, the youngest son of the family died in the motorcycle crash. On May the 20th, we celebrated the Eucharist at the Seminary to remember Juan Francisco's full participation in the Communion of Saints and to pray for strength for the family. Fr. Hugo could not be present, since he was visiting the communities in the northern part of Barillas Huehuetenango. The rest of the family attended the Mass. On the evening of May 21st, Bishop Eduardo blessed the Oratory of Saint Joseph. It is located in Guatemala City, at Jardines de la Asunción, zone 5. The Oratory is animated by Fr. Herberth Urrutia. Besides the Oratory Fr. Herberth is establishing the Fraternity of the Eucharist. It is a Fraternity formed by Christian Faithful, consecrated to deepen the love and adoration to the Eucharist. During the celebration, four members of the Fraternity received their habit. The Oratory is particularly committed to rediscover the elements of the Catholic Orthodoxy. Their building is decorated only with Icons. On Friday the 22nd, the Bishop celebrated the Eucharist with the Communities of Santiago Atitlán. 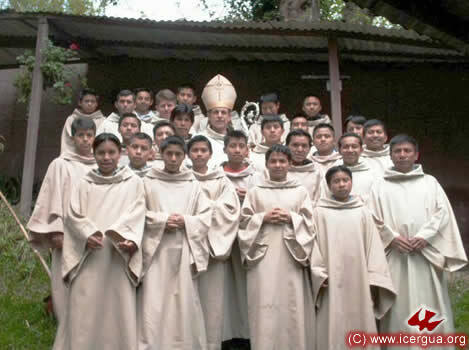 The first Mass was celebrated with de "Comunidad Efusión del Espíritu Santo", where several children were baptized. The second Mass was celebrated with the "Comunidad Pentecostés", where a Minister for the distribution of the Holy Communion was instituted. Above: The Choir of the "Comunidad Efusión del Espíritu Santo". To the right: the institution of the Minister for the distribution of the Holy Communion at the "Comunidad Pentecostés". The Community of K'ankintik is located in Nenton. 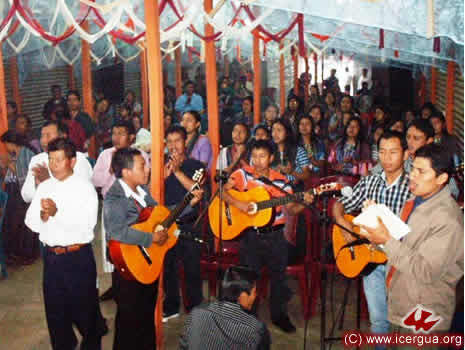 It was the first community in Nenton to enter in ICERGUA. TO THE RIGHT: At the left of the new church there is the old small church of the community. The new Church is practically finished. The colors and the facade of the new building, reflect peculiar aspects of the Chuj Culture, to which the people of this community belong. A sight of the People of God gathered for the Mass in K'ankintik. During the Mass there were celebrated many Baptisms, Confirmations and several children made the First Communion. 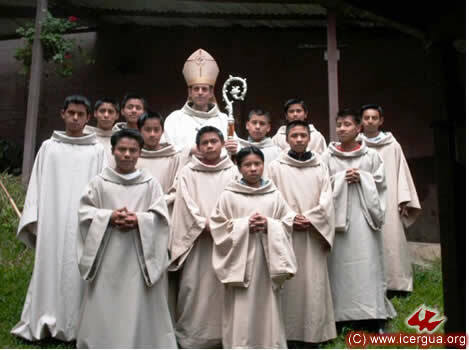 One of the newly formed Renewed Catholic Communities is the one located in San Gaspar Ixil. With the support of Brother Pascual of Colotenango and several members of the Buena Vista Community from San Pedro Necta, this community has been growing very fast. During the celebration of the Mass there were also celebrated Baptisms, Confirmation and First Communions. Among the parents who brought their children to be baptized, there was a couple from a Village in Concepcion Tutuapa, San Marcos, bordering with San Gaspar. The have just started a new community in their Village and now they have 40 members. The pictures above and to the right: they show different moments of the celebration at San Gaspar Ixil. The community doesn't have yet a church; nevertheless they are in the process of organizing the committee to begin with the building process. 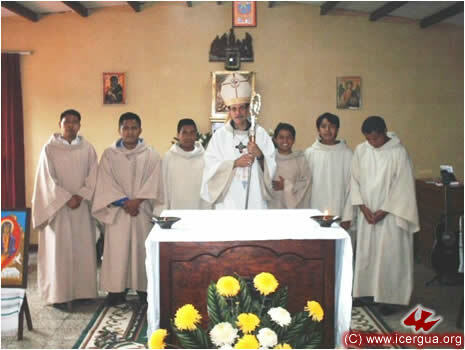 On the evening of Sunday May the 24th, Bishop Eduardo celebrated the Eucharist at Chinacá, Huehuetenango. During the Mass, two boys were baptized, two children made their First communion and two young adults were confirmed. Recently the community has experienced a strong growth, specially the youth Ministry. The picture at the left shows a moment of the celebration. 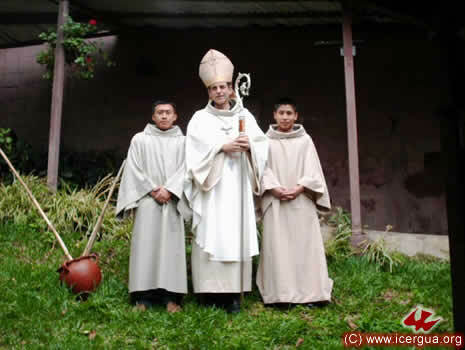 To de left of the Bishop, there is Brother Valentín, leader and apostle of the community. On the evening of May the 30th, Eve of Pentecost, our Bishop presided the Adoration of the Blessed Sacrament, celebrated the Sacrament of Reconciliation and the Mass, in Los Angeles. There were attending hundreds of members of the three communities of the mission in Los Angeles. Everybody had the opportunity of experiencing the coming of the Spirit, as we believe the apostles experienced on the first Pentecost day. 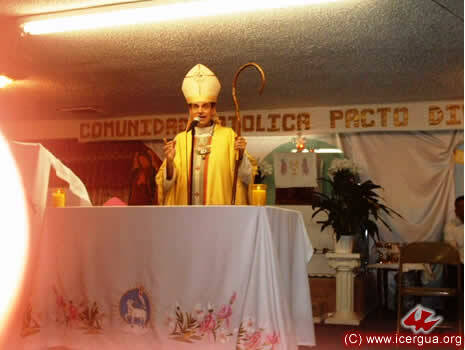 On May 31st Bisho Eduardo presided over the celebration of the Eucharist at the headquarters of the Comunidad Católica Renovada El Pescador, on 8th street and Union, in downtown Los angeles. 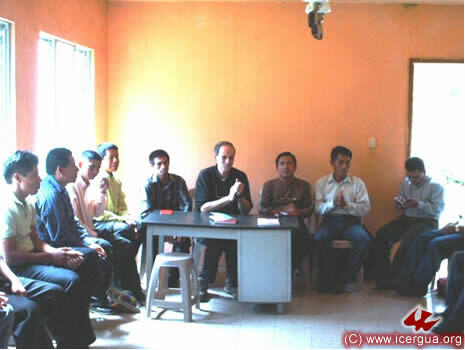 After the Mass it took place a meeting with the Pastoral Council of the Mission. 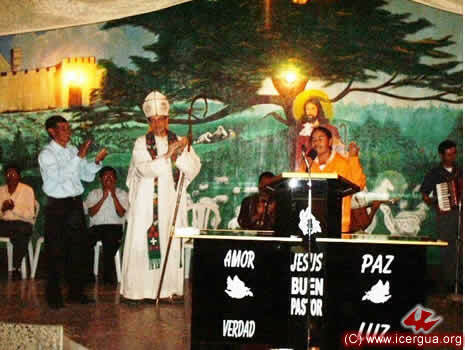 The leader of the Community "Palabra en Acción" was introduced to the bishop. They are considering the possibility of applying to be members of the Mission. There was also a long exchange about the church dimension of the sacraments and it was unanimously decided that the Baptism, Confirmation and Marriage will be administred only to those who are permanten members of one of the communities incorporated to the mission.